Supported by friends and colleagues from Provident, the Red Devils have hosted a week of activities engaging our fan base in men’s health related activities. This has included State of Mind supporting at the Catalan Game, Touch Rugby League down at Folly Lane and a training session at Bury Broncos to name a few. The Foundation’s delivery team, alongside first teamers such as Corey Paterson and Adrian Morley, deliver a wide ranging programme of activities including talks and boot camps designed to engage local males in healthy pursuits. 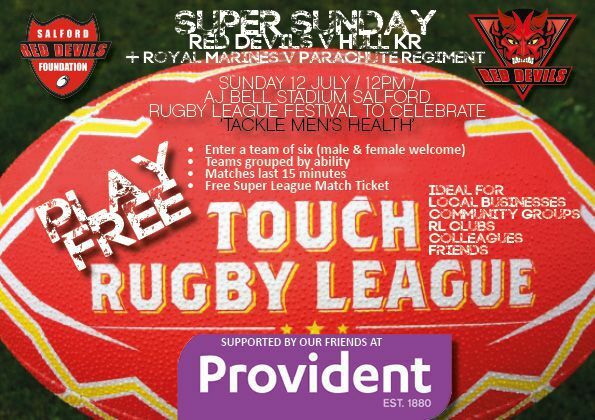 Undertaken through a partnership with Salford Clinical Commissioning Group, this latest activity will culminate in fitting finale to showcase the Red Devils’ and Provident’s work is this field. As part of our Men’s Health week State of Mind supported our Red Devils against Catalan Dragons on Sunday 5th June as part of their Round 20 (in partnership with Rugby League Cares) . Red Devils players also showed their support by warming up in State of Mind t-shirts. Prior to Kick off State of Mind volunteers were out and about engaging supporters in their theme of ‘looking out for people or your mates’ with their mental fitness cards and flyers. Thanks to Provident we have been able to hold a number of activities out in the community promoting Men’s Health such as the session we held at Bury Broncos engaging 22 males aged between 18 to 56. Our SRDF coaching staff, Danny Barton (Sports Manager) and Jay Boyd (Development Officer) delivered a 2 hour coaching session on movement with and without the ball, creating space and fund drills leading into a game of touch. Although the session was structured the main emphasis of the session was to have fun and encourage males to participate in regular physical activity. Participants of both sessions were also given information on our Tackle Mental Health programme further supporting the Provident Men’s Health event. We have 12 teams signed up for the day comprising of groups such as local amateur clubs, teachers and business partners. If you are keen to join in on the day then please come down and give it a go! You don’t have to be in a team, individuals can join in too!